Earl HARTSOCK from Speers Ferry, Virginia. Earl traveled the world for many years serving in the Peace Corp. I worked with Earl in 1975, in Iran, but not in the Peace Corps. 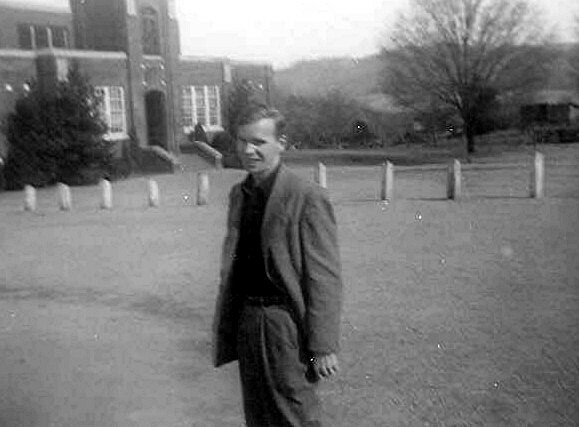 My guess is that he was a well-worked 50 at that time, so I’d take a guess that he is about 30 in this photo, making my guess the picture was taken in the mid-1950s, before the Peace Corps was established. I had to fire him from our job in Iran when he failed to report to work for a week, but he was a likable man with sparkling blue eyes and a propensity for laughter. I don’t guess he laughed much when he thought of me, though. Too bad, because he is a nice man.